Jason hails all the way from England, where gardening is a religion. 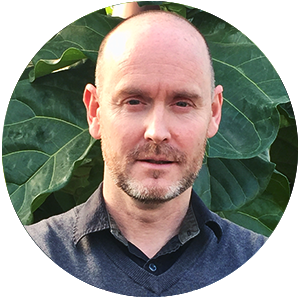 He first ventured into the world of landscape design when studying horticulture with the Royal Horticultural Society just outside of London. After exploring the design side of things, he found his stride and traded his trowel for a pencil. Since finishing his education, he’s worked in with the BBC designing gardens on the telly, then with practices in London and Dublin, before making the journey to Canada where he now works with the Salisbury team. It’s a long story. Years ago we came here on holiday and I always thought it’d be a great place to live – it always is when you’re on holiday, isn’t it? Anyway, there were some changes afoot back home with the way the office was running and the recession, and all those sorts of things and I just thought I was ready for a change. So, I put out a resume online, Salisbury saw it, I got in touch, and when I got out here, I really liked working with them. What drew you to landscape design or even horticulture? What drew you to that stream? You know, it’s strange, because I was actually quite young when that happened and gardening wasn’t really something that many young people got into – at least, not in my situation. You know, I was one of the lads that played a lot of soccer in England, drank a lot of beer, hung around with my friends who were a bunch of thugs, really. But, I don’t know… It was one of those things where I got a new house, found the garden at the back of it – although, it took me about 5 years to even realize there was a garden out there – and I kind of got started on that in the way that I suppose a lot of people do. Then I just wanted to learn more and more. I kind of felt like I wanted to be, you know, a gardener. And that’s why I went to study horticulture. It was only when I started that I realized that I don’t like working horticulturally, but the design side was shaping up. It was working for me, too, because there was a few of us on the course, but I was always getting picked to do this and picked to do that. So, I had an aptitude for it to a certain degree from an early start. I mean, everyone’s capable to a certain point but not a lot of people can see the art of it – what you need to see, like line, flow, shape, balance, and proportion. And I can. It was a love of art and a love of horticulture that created the perfect mix. Tell me about your first design project. As part of the course I was in there were lots and lots, so I couldn’t tell you the very, very first one that I did as part of the training. But, I do remember the very first one that we built from a design I did. On the course, there was 8 of us and the idea was that all of us had to design a show garden, then we’d all nominate a winner from those 8, along with the guy who was leading the course. Then we’d have to go out and find the money, find the plants, and build it with no assistance – we had to do it all ourselves. So, I designed this kind of courtyard garden for a hospital, like a seating area sort of thing, and painted it bright pink. And it did get built for the Tatton Flower Show! I’ve always preferred the idea of giving gardens to people, as opposed to a family or a home. I always wanted my gardens to be something lots of people would use. So I always used to design public spaces more than I would design residential gardens. That was the joy, I always thought. Tell me about your favorite design project that you’ve done to date. 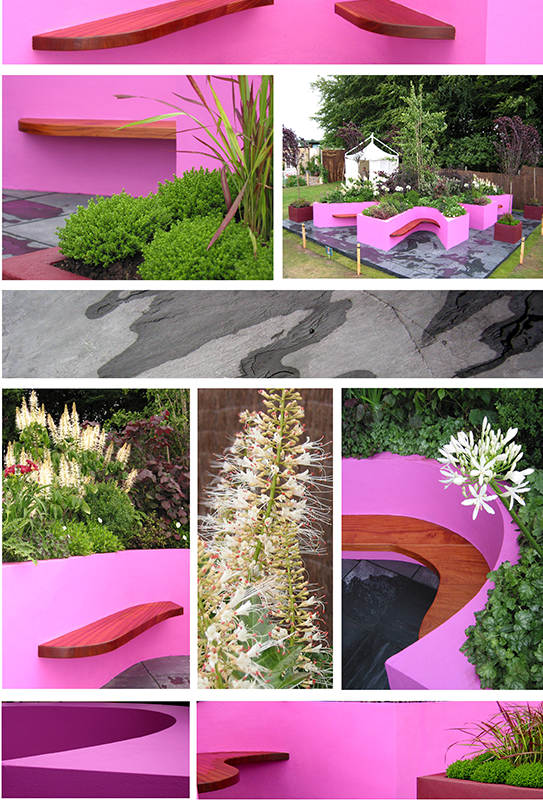 I think it was in 2007, we worked on a garden for the Chelsea flower show – you know, where the Queen comes around – and we did an artist retreat. There was a little studio, kind of a glass and wood pavilion, and there was a pond. And we did the paving all in this Portuguese limestone – the guys came over from Portugal and laid these little coals in the shape of petals. Looking back, when I worked at that practice in London, we used to do some really amazing stuff. The last garden I designed before I left, which I never really got to use because I came to Canada just as it was being built, was a 7-story pyramid made out of scaffolding. It had vegetable gardens, a big slide from the top to bottom, cafes, and everything just going on on all of these levels, so we were really pushing it. And a year or two before that, I built a garden on a crane, so it was up in the sky. We did a lot of “out there” stuff. It’s different – there’s just a joy about gardening in England. It’s the capital of gardening in the world, without a doubt. What inspirations would you say influence your designs most? I would say architecture and old gardens, like, hundreds of years old. Maybe modernism, you know, from like the 1910s, 1920s, but not really anything after that. Nothing contemporary, I like to make my own contemporary. I also used to like furniture design, what was going on in line, form, and shape, and taking some of that and moving it into the garden, as well. I’ve never really found it from looking at other gardens, though. Which projects would you say you are most passionate about? My ideal people are definitely those that are a little less worried about the process and more trusting in the finished project, and those that are more imaginative and driven. I like clients who are progressive, who want something out of the ordinary and are willing to pay for it. People always say, “Well, if you’ve got less money, you have to be more creative.” Unfortunately, you’re less creative because you’re limited. With $2500, it’s hard to do any more than throwing in some sod and a tree. If you were given full freedom, both financially and creatively, what would you most love to create in a design? If it was a wishlist and I could pick and choose anything I wanted, it would be a garden where I’d be doing it for a community or a group of people to interact with. I’d get more pleasure and joy for designing gardens for lots of people to use, not necessarily one family. You know, I have no problem with that, but creativity-wise, I like the idea of giving lots of people different things within one job. Something so wild or completely different from anything else anyone else is doing around here. That would be the ideal – a completely off-the-wall sort of thing. 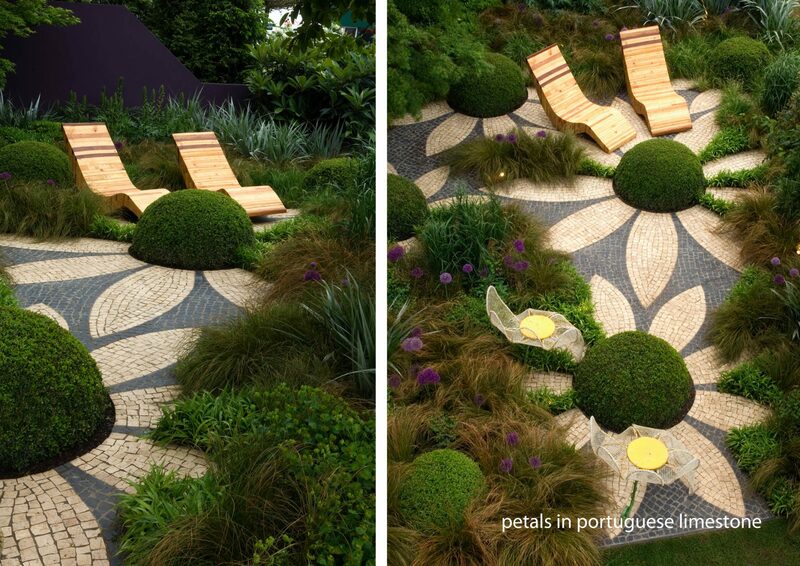 Realistically, something a little bit more modern – even a traditional garden done in a modern way with minimal line work. From start to finish, can you just go through the basics of your design process? Somebody calls in, I go out to see them to talk it through and hear what they want – what, where, when. It’s important to get a sense of how they live, how the house works, and what the inside of the house is like – it gives you a good idea of what the outside might look like. If they’re living ultra modern inside, chances are they’ll want to be slightly modern on the outside, too. Then, I go back, get a copy of the plan, and I start to draw everything by hand initially just to plan more and get things down quickly. I don’t do any designing on the computer until I’ve done it all in pencil because on the computer, you’re too invested to make changes as you go even though you know it’s not quite right. You spent too long doing it, so you think, “Oh, for god’s sake, I don’t have time to change it.” If you do it in pencil first, you can make these changes as you go. Once I feel happy that balances are correct, I start to put it in on the computer and start to build up the layers up from there. Then, I quantify plants, but I don’t really specify any until they’re in-stock at the greenhouse. I like to do that with the clients themselves, as opposed to dictating what they’re going to have. I try to make it a bit more of a joint process. What advice can you give to those considering their first landscape design project? I would say draw up your plan by hand. Get inspired first – look at furniture design, look at architecture. Look at art, lines, flow, and balance. Don’t necessarily look at other gardens, but by all means, you can. Try to break it down, not copy, and get those ideas to work on your own space. Garden designing is not that difficult if you want what everyone has got. What is difficult is to have something that other people don’t have and 95% of people, or maybe even more, have the same as everybody else. For me, it’s asking, as a designer, can they give you something no one else has. As far as budget, I wouldn’t worry too much about money. Get your ideas out there first, and have something to do work toward. It just depends if you want to do the work yourself or if you want to do work with a company. You’re either going to fork it out of your own pocket and do it as you go, or pay someone to do it.